The good news is that my darling Sister and the Wonderful Dutchman loved the venue!! YAY!! Today I sat and made our 'Save The Date' cards. 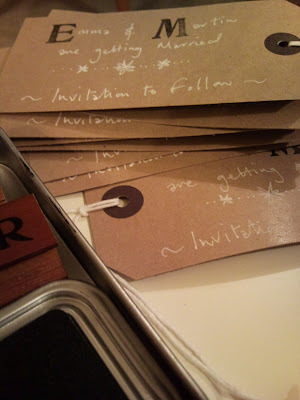 It was such fun...they are so simple, just a big luggage label hand stamped. 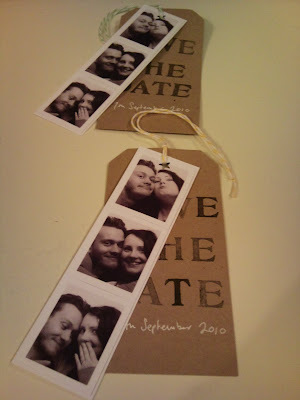 Hand written with a white pen, and cute little photo booth pictures for a bit of fun. All finished off with some Divine Twine....in our colours of course! I long for Britain to bring back the old fashion photo booth...but no-one had heard my cries. We had to go into a normal booth 3 times to get that old fashioned look. But once they were cut up and scanned it worked out really well. We both adore the look...fun and so very cheap!! Darling! 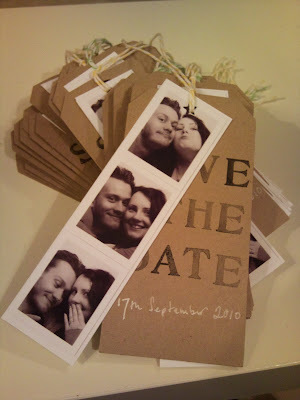 What a fabulous idea...very clever and fun! Just found you through Liv. How wonderful they are. I wish we had the old style photobooths. Where did you get your stamp? Or did you make it yourself? Where did you get the luggage tags from? The luggage labels where from sussex bookshops, or whsmiths i cant remember to be honest!! The stamp was single letter stamps from Cavailli which you can buy online with no problem. Emma-- fantastic! 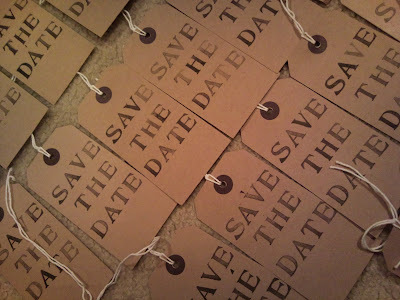 We found this little cute vintage champagne bottle shape save the date magnets. We'd like to send out with a similarly shaped luggage label, like your design-- any ideas where we can have this done at? 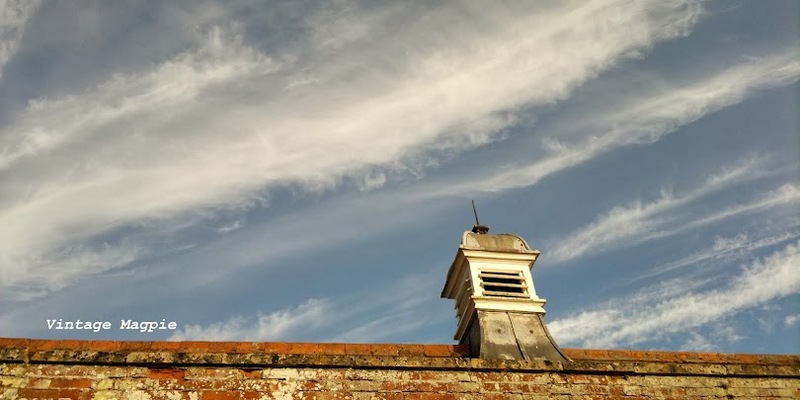 I've bookmarked this blog, so I'll check back in a few days for comments-- nice work again! I dont know where would be able to do this for you. If it was me i would just glue dot them onbto a luggage label and pop in a nice envelope! I have found over the last year that these little people take up rather a lot of time, and my former quite, creative space has been taken over by a gorgeously noisy boy...who loves to scour the floor for tiny items of treasure. It would seem the love of sparkle and this magpie eye lives on in him also! I have found myself making smaller project and getting out my needle more regularly. I'm unsure where it will take me. I am, however, very excited by a new direction! 30 something girl, Mama to August living in the country. Scottie dog loving, bespoke wedding bouquet designer, florist, with a passion for anything Vintage, as well as long walks on the beach, spring flowers, gin and tonic, sunrises, Stanley Spencer, olives, Family and friends, Vivienne Westwood, laughing, picnics, and the smell after rain in summer. 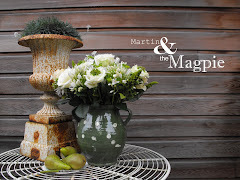 Vintage Magpie is my beautiful business. 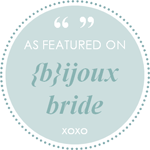 I lovingly hand make wedding bouquets, cake toppers and sell divine treasures. Anything with a feel of the past, from sparkling crystals, stunning old jewellery, french fabrics, to retro buttons. I'm just a girl following her bliss to live a happy, fun, and creative life. Oh to have a 26" waist! The first of January 2010! !